A move in Pokémon media. When Curse is used by a ghost, the user loses half of its maximum HP in exchange for cursing the target, which causes the target to lose HP each turn. 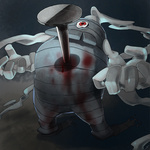 The battle animation shows a nail piercing the user when Curse is used by a ghost. When used by a non-ghost, the user loses Speed, and its Attack and Defense rise.